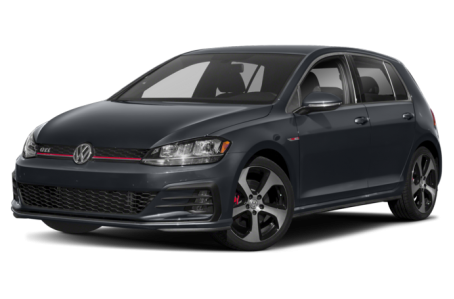 The 2019 Volkswagen Golf GTI is a high-performance version of the compact, four-door Golf hatchback. Maximum cargo capacity is 22.8 cubic feet of cargo room. Four trims are available: S, Rabbit Edition, SE, and Autobahn. Under the hood, the Golf GTI is powered by a standard 228-hp, turbocharged 2.0-liter four-cylinder engine mated to a six-speed manual transmission or a six-speed dual clutch automatic and all-wheel drive (AWD). Fuel economy for the Golf GTI is an EPA-estimated 24/34 mpg city highway.